The photographic evidence isn’t very clear, because I wasn’t expecting today to be a photo-op and wasn’t well equipped. But Crossbo had yet another encounter with a celebrity surrogate rider. Like last year’s experience with the Mounties, I once again entrusted Crossbo to the hands of someone who was frustrated with my inability to achieve his full potential. 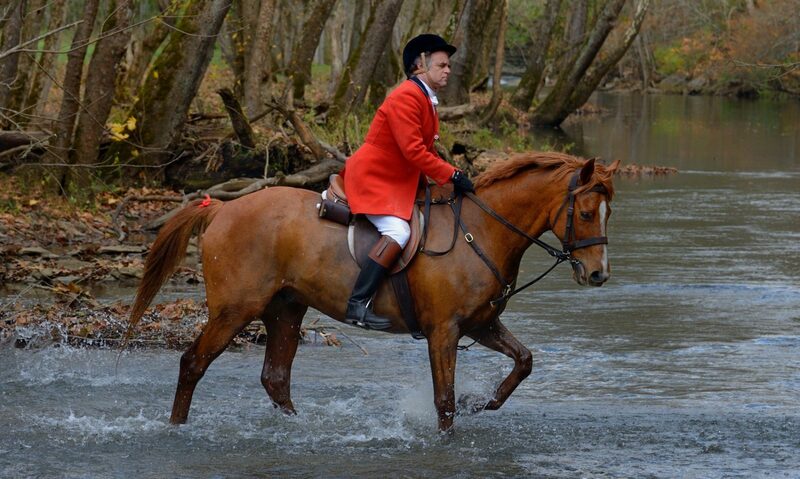 What do you say when the next First Lady of Kentucky asks to ride your horse? 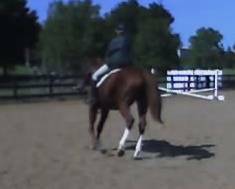 Since she’s an eventer who rides at a level way out of my league, and has provided me with some valuable coaching in the past, and was once again offering assistance, the only reasonable response was to dismount and hand her the reins. Steve has a tremendous lead in the polls, with neutral political experts saying he’s virtually unbeatable, so he gave Jane a day off from the campaign trail to come play with the gang at Masterson. She was preparing for an upcoming event, so she was looking for more challenge than most of us, who were just trying to get ready for another foxhunting season. I kept reminding myself that trying to do everything she did would be foolish, so i hung back with the rest of the crowd seeking less challenge. At one point, she saw me eyeing a bigass log she had just jumped and said “Crossbo can do that.” So he did. I told her that I’d been trying to be cautious and not let my ego get the best of me, because I knew I couldn’t do everything she could. She responded that she was on a young horse, and today, I could do anything she did. So we started to have a little more fun. After a little more trotting around and jumping over stuff appropriately sized for all of us, Jane headed towards a trail through the woods. The rest of the party declined to follow because of the “housey things” on the trail. The “housey things” weren’t very big, they were just not the kind of things that would be encountered in the hunt field, so horses without the diverse experience of an event horse would find them unfamiliar and possibly frightening. But I decided that diverse experience would be good for Crossbo, and Jane had already encouraged me, so we followed her through the woods and over the “housey things”. As we emerged from the woods, she looked back and said “Follow me”, words I’ve never been able to resist from any female. We took a couple more jumps, and then rejoined the group and started heading back towards the trailers. Jane was heaping praise on Crossbo and warned me that I might soon get bitten by the eventing bug. I told her Crossbo didn’t want to do that dressage stuff. She responded “That horse can do dressage,” and started giving me instructions. It soon became clear that even if Crossbo could do dressage, I definitely couldn’t, so finally she said “Do you want me to show you?” So I dismounted, and she took him into a ring, and started to show us magic, accompanied by even more effusive praise for Crossbo. (She called him a “gold mine” at one point.) The only camera I had was my Razr. Its photographic inadequacy was rendered even worse by its display’s invisibility in sunlight. I couldn’t see what I was taking pictures of, so I just pointed it in their general direction and snapped a few shots, and managed to get nothing better than the image you see here. Next PostNext You’ve come a long way, Kentucky!